Learn the procedures to file your next brief. As a pro se litigant, your success will depend on your own knowledge of the law and whether you can argue your claim in the proper way. That can be quite overwhelming. Let us help guide you through the appellate brief process with a step-by-step guide. 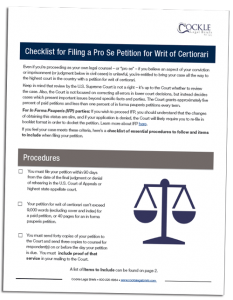 This checklist covers the essential procedures to follow and items to include when filing your petition. It is designed to shed some light on what you can expect as you prepare for your day in court. It is our hope that the information provided might make this process less stressful. Download our Pro Se checklist by filling out the form below. Would you like to speak with Cockle Legal Briefs about your petition?